Why are your Cake Art raspberry swirl cupcakes so delicious? Fresh ingredients make for better flavor. 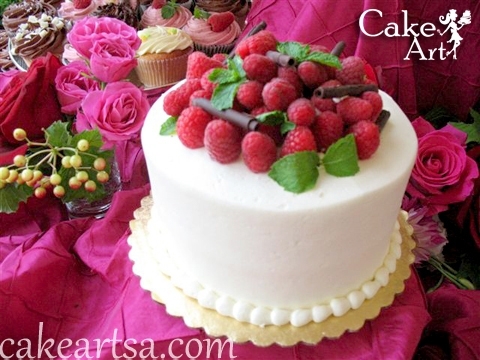 At Cake Art we bake fresh daily for the best tasting treats in San Antonio! Insist on Fresh Cupcake, Never Frozen! We bake scrumptious raspberry swirl cupcakes fresh every day. We never freeze because freezing affects both the texture and flavor of your cupcake. Finally, how you work the fresh ingredients makes a difference. When do you whip? When do you fold? What are the best proportions, temperatures and baking times? Years of research and taking the time to get it right guarantees a moist, delicious raspberry swirl cupcake every time… one that stands up to our yummy cupcake fillings and cupcake icings. Yes, You CAN Have Beautiful AND Delicious! Top quality fresh raspberry and vanilla changes everything. We’ve researched a variety of fruit suppliers and vanillas and chosen fine Madagascar vanilla to make sure you enjoy the richest, most delicious bands of raspberry and vanilla in your raspberry swirl cupcake! Happy eating! When you start with the right cupcake and add hand-made cupcake filling and icing, you can enjoy a presentation that is as appetizing to see as it is delicious to eat. Enjoy the everyday elegance of the cupcakes we bake daily, or call or e-mail for custom cupcakes to surprise that special someone… even if that someone is you! Ready to make San Antonio’s best raspberry swirl cupcake your raspberry swirl cupcake? Come by Cake Art in San Antonio, Texas, send us a message, or call us today at (210) 277-0308.